Sometimes there’s nothing better than popping on a pair of headphones and being transported to a world of your own. However it’s probably worth trying to pay attention to what’s going on, otherwise you may end up in a situation like this. 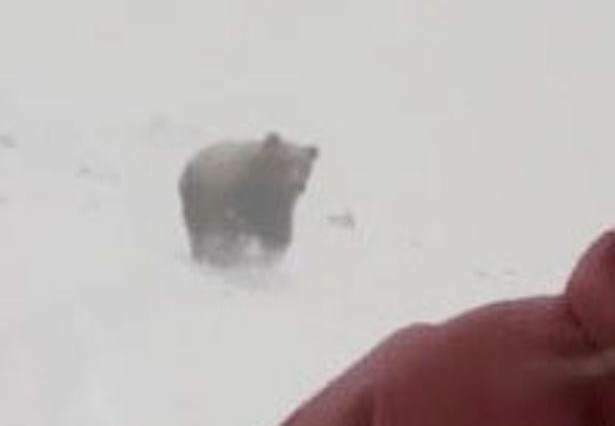 Kelly Murphy was snowboarding at Hakuba 47 Winter Sports Park in Japan when she recorded footage of the terrifying moment she was chased by a bear and didn’t even realise it! The video shows her singing the Rihanna hit Work as she straps on her board and sets off down the mountain, holding her camera on what appears to be a selfie stick, the Mirror reports. While she enjoys her ride, and speeds down the hill, a large and extremely grumpy sounding bear can clearly be seen barrelling after her. Thankfully the animal never catches up, although it does look to be moving at some speed down the mountain and at one point gets worryingly close. Kelly didn’t realise quite how close she came to one of nature’s most dangerous predators, until she uploaded the clip to YouTube and was stunned at what she saw. I was singing Rihanna ‘Work’ and didn’t know it was behind me! OMG! I was going through my snowboarding videos and I found a bear chasing me! I nearly got eaten! However not everyone’s convinced that Kelly’s brush with danger was real and one YouTube commenter wrote: “It’s a fake viral video.” To be fair this would make a great advert for noise cancelling headphones. Hakuba 47’s ski slopes reach heights of more than 5,000 metres, and in Kelly’s defence bears are reportedly common there. Specifically, Asian black bears are regularly sighted on the mountain and there have been reports of attacks on men in nearby Nagano commonplace. Do you think Kelly’s brush with a bear was real?